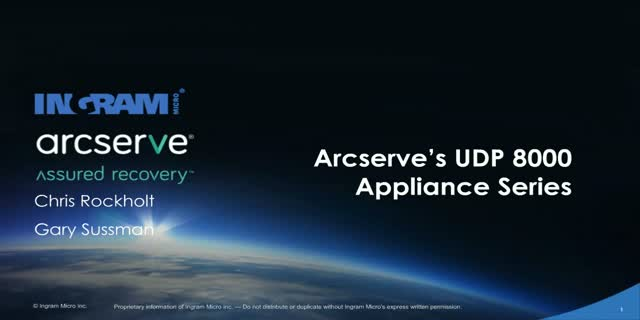 Protect your vital email records and simplify compliance with Arcserve UDP Archiving. Ransomware is a growing threat to your business, and the consequences of an attack could be devastating — from critical data loss and business downtime to lost revenue and damage to your reputation. Relentlessly protect your data from ransomware! Software-based snapshots for VMware & Hyper-V host servers can significantly burden virtual machine performance. The solution, utilize Arcserve UDP hardware storage snapshot copies for high-performance backup without sacrificing virtual machine performance. Arcserve delivers the only data protection solution to uniquely combine enterprise-grade capabilities with the simplicity required by small and over-stretched IT teams, proving power and resilience can coexist with simplicity and elegance. Join us as we discuss the latest version of Arcserve's Unified Data Protection solution. Join us for a live demonstration of our award winning solution. How to plan an effective disaster recovery strategy for combating malicious threats like ransomware. Due to Brighttalk technical difficulties on 10/27 we are re-hosting this webinar for people who were unable to attend or have their questions answered. We partner with market leading technology providers world-wide to offer you a complete solution for your backup and recovery needs. Join our webinar to learn more about how we can work with our technology partners to adapt to your customer's unique environments. There is a lot of talk about who's the best in the business. But what do the numbers say? Join us as we take a look in the world of data back up and disaster recovery to see how Arcserve stands up against the competition. If yours is like most environments today, you have a mix of hardware, software, virtual platforms, as well as cloud platforms supporting different applications with diverse needs. As your IT environment has evolved to support cloud, virtual, and legacy, how has your data protection infrastructure kept pace with the changing needs and functionality of today’s data center? And as more and more data is generated, processed, stored and preserved for longer periods of time, what are the additional threat risks you need to protect your data and applications against? This webcast looks at the industry trends, issues, and challenges you face as your environment quickly evolves, and helps you determine the best protection strategy and implementation for your environment: The Triple Play. Because Fortune 500s shouldn’t be the only ones to guard against expensive downtime. Meet Arcserve High Availability—your data geek that never sleeps. We've won over 10 awards in just the last year! Arcserve UDP is the next generation architecture that’s raking in awards and rave reviews for its ease-of-use, comprehensive feature set, and outstanding reliability. Arcserve Unified Data Protection is an award winning, easy-to-use data protection and recovery solution for virtual, physical and cloud systems.